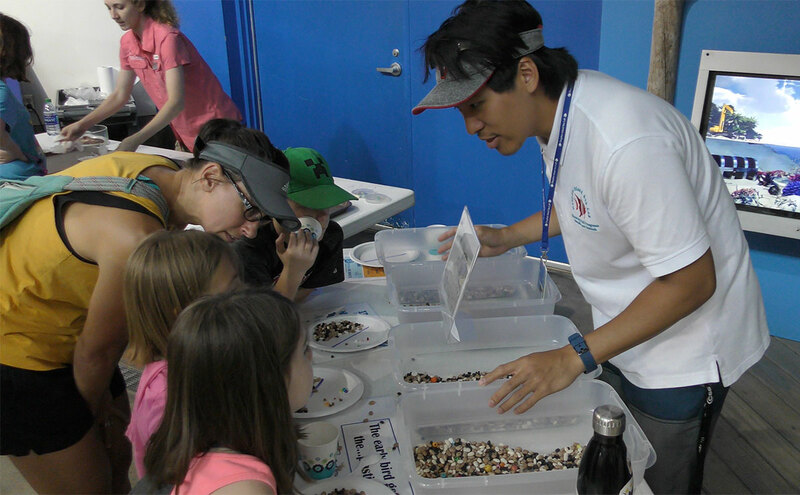 Discovery Hall Programs summer intern Alex Lau leads an activity during World Oceans Day at the Estuarium. The month of June is dedicated to raising awareness of the health of our oceans and how you can be a leader in improving its future. June is National Oceans Month with World Oceans Day recognized each year on June 8. This year, the Estuarium at the Dauphin Island Sea Lab joined the global mission on World Oceans Day to prevent plastic pollution and encourage solutions for a healthy ocean. "We all contribute to the problem of marine debris by using single use items, such as plastic straws and plastic bottles, even if they're discarded properly," Mendel Graeber, Estuarium educator and World Oceans Day event organizer said. Activities on World Oceans Day at the Estuarium included a crab crawl through a marine debris field, creating marine debris display with trash collected from area beaches, and a look at how microplastics can be mistaken for food by marine animals and birds. Discovery Hall Program educators are part of the efforts by the Gulf of Mexico Alliance's Education and Engagement Team and Marine Debris Initiative to create new opportunities for communities across the Gulf to improve their surroundings. A recently produced video by GOMA highlights efforts across the Gulf to assess, reduce, and prevent marine debris. Those efforts includes DHP's Tracking Trash. "For Tracking Trash, we're working with teachers to reach students," DHP Chair Dr. Tina Miller-Way explained in the video. "Students are told about the problem of marine debris, and also introduced to some of the technology that scientists use to study currents in the water." Plans include sharing lesson plans developed from this project with teachers on all levels. "In Alabama, and really across the nation, teachers are bringing a new way of teaching science into the classroom. So, we're giving teachers the opportunity to integrate engineering to a practical problem that students contribute to, and also can help us solve," Dr. Miller-Way said. Discovery Hall Programs present a class during the academic year focused on marine debris. Learn how to get your students involved by clicking here.